Dubai, UAE, April 12, 2018: Happiness starts with a healthy well-being. But truth be told, people are so caught up with the chaotic and hectic world that health has been taken for granted and so genuine happiness becomes difficult to achieve. In line with one of the core objectives of the UAE Ministry of Happiness to “instill a culture of happiness and positivity,” Skyline University College Executive Director and Chair of the Executive Council, Mr. Nitin Anand challenged the whole faculty and staff of Skyline to start leading a healthy lifestyle while creating a harmonious relationship among employees. Inspired by the Dubai Fitness Challenge initiative by His Highness Sheikh Hamdan Bin Mohammed Bin Rashid Al Maktoum, Crown Prince of Dubai and Chairman of the Executive Council for Dubai Government, Skyline’s version of this initiative was the Skyline Mega Fitness Challenge—a 30-day challenge that tests one’s self-discipline, strength, and fitness, and whoever loses the most weight at the end of the competition wins a grand prize. “After sharing to the whole Skyline community the challenging phase concerning my health and the fitness journey I have undergone to beat the worsening scenario of gaining unnecessary pounds, I was surprised to the overwhelming response from our employees who came through and accepted the Skyline Mega Fitness Challenge with me. The realization that hit me after having been able to finally get back to my normal weight is that exercising for 45 minutes a day with no excuses is not hard after all. In fact, it was a win-win situation where I started losing weight and got happier as weeks and months went by. And I thought, I wanted to inspire the Skyline community to do the same and have their own reflection of the journey afterwards. At Skyline, we believe that health is one of the most important keys to success,” Mr. Nitin happily shared. Skyline Mega Fitness Challenge was launched on February 20, 2018 and ended on March 20, 2018. Some of the activities of the challenge were yoga sessions, Zumba, hurdle race, and sports such as volleyball, basketball, and football. A dedicated one hour was given to all employees either to join the activities or go to the gym. At the end of the challenge, the Skyline community have lost a collective 29.7kgs out of 59 participants. Three winners have stood out with the most weight lost after a challenging 30 days namely, Mr. Jaymar Claridades, 4.6kgs; Mr. Sanjay Benjamin, 3.5kgs and; Dr. Robinson Joseph, 2.4kgs. 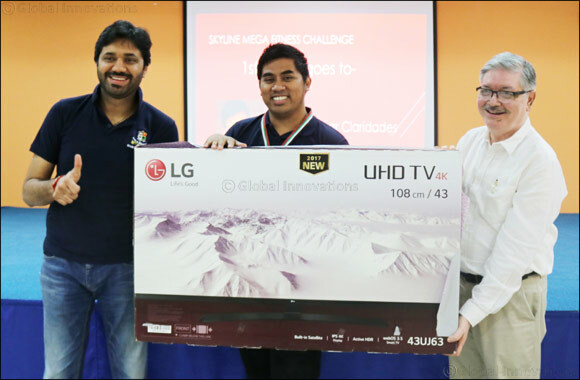 The grand winner was awarded with a 43-inch TV and Fitbit for all the winners as their prizes during the closing ceremony on March 28, 2018. The pilotage of the second edition of the challenge has been passed on to Skyline Dean, Dr. Amitabh Upadhya to decide the next theme of the of Skyline Mega Fitness Challenge, which is set to run all-year round. Prior to the Skyline Mega Fitness Challenge, Skyline has an on-going initiative called the Skyline Happy Hour—a one hour brain-training activity for employees where they are asked to solve fun riddles and puzzles that also come with daily prizes. These initiatives do not only promote work-life balance and encourage people to lead a healthy lifestyle but most importantly, they create an atmosphere of positive, happy people in the workplace who look after each other, and motivate and inspire one another. With the Skyline Mega Fitness Challenge, Skyline has proven that happiness begins when one has a healthy mind, body, and soul. And with the UAE’s effort to promote happiness among the locals and residents, and in order to achieve its goal to be one of the happiest countries in the world, Skyline vows to take part to the country’s initiatives and make a difference in the society.